Announcement: I present about Angular Service Worker this Tuesday, November 7 at AngularConnect conference in London. If you wish to follow me at the live video stream, please mark your calendars: 11:20 am, GMT (right after the keynote), the main stage. There is some time left since the first part of this article was published, and this pause was taken intentionally — the functionality was ready to practical usage only after a few more Release Candidates since the initial appearance. 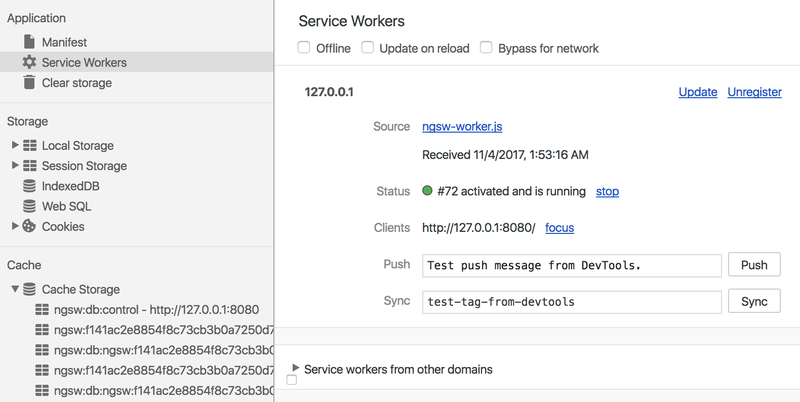 Now the Angular 5 release is here, and Angular Service Worker (hereafter NGSW) is ready for being explored. 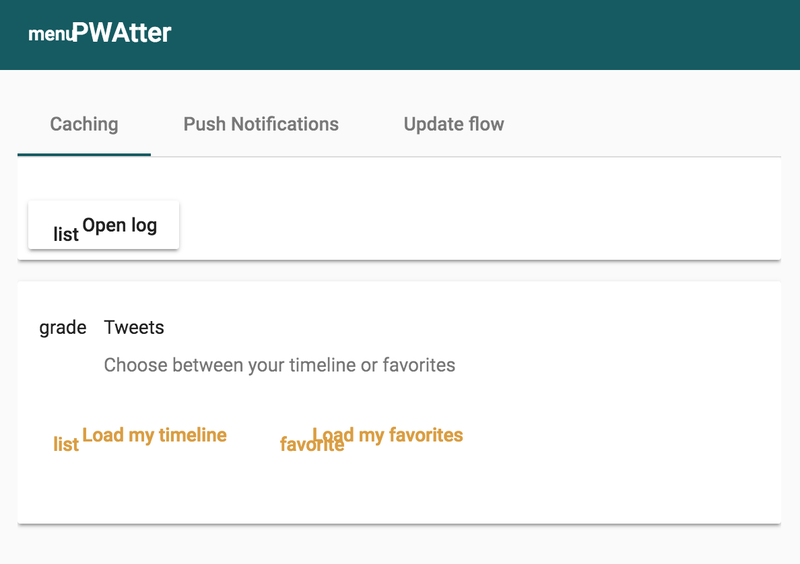 We are going to use our PWAtter — the tiny Twitter client — again. The source code is available on the GitHub (branch ngsw). Also, we need a simple backend to serve tweet feed and handle push notifications. Source code and detailed setup instructions are also available on the GitHub. Immediate start in both offline and online modes: we need an application shell to achieve this. 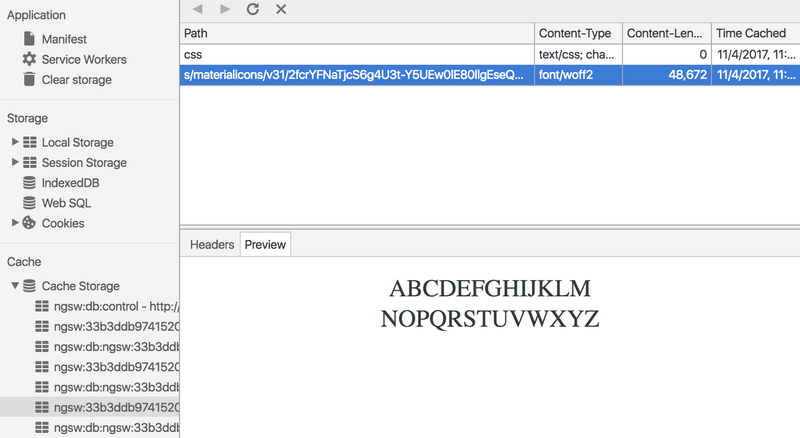 We have some external files (webfont with material icons) as a part of the application shell. By “external” we mean that these resources are not the part of our dist folder. Optimized networking for API calls (runtime caching): we could serve some earlier accessed data during offline, as well as we could speed up online mode by serving this cached data instead of the network roundtrip. The application shell should have the regular for PWAs “stale-while-revalidate” update flow: if possible, we always serve the latest cached version (to show it almost immediately). At the same time, service worker checks if there is a newer version of the app shell. If yes, we download and cache this version to use it for the next application run. Also, we might want to ask the user if they want to reload the current tab with the application right now. Let’s go point by point, but first, we have to make some notes about Angular CLI state. At the moment we have Angular CLI 1.5 as a release. Unfortunately, there is no NGSW support yet, it’s planned for 1.6. But by the exploration of corresponding pull requests (to CLI and to DevKit) we can easily understand how will it look and reproduce the main functionality. Let’s have a look into the nearest future. Anyway, even after CLI 1.6 will be released, it’s good to know how to reproduce these steps, because we have to perform them manually to add NGSW support to the existing app. Let’s go to add Angular Service Worker to PWAtter. or manually add/edit this parameter in .angular-cli.json file. Important! For the moment, when we use Angular CLI 1.5, please make sure that you don’t have this property in .angular-cli.json, it will cause build errors. See how to emulate this step in Angular CLI 1.5 below. 2.1 Generate NGSW control (manifest) file ngsw.json based on NGSW configuration file src/ngsw-config.json using NGSW CLI ngsw-config. You can find more details on this small utility in the previous article. 2.2 Copy NGSW itself from the npm_modules package folder to our dist folder. Now if we run npm run build-prod-ngsw we’ll have Angular PWA in the dist folder. Optionally, we could serve it using the simplest http-server by running npm run serve-prod-ngsw. Important! Do not use ng serve to test your Angular Service Worker. This development server was not designed to work in collaboration with PWA flow. Always build a production version of the app and serve it from your distributive folder using any static web server. Important notice: Chrome v62 and earlier might handle Offline switch incorrectly, allowing service worker to send some requests to the network. To emulate the offline mode which is closer to the real one I recommend to use Chrome Canary (v64 at the moment). Also Chrome Canary has better UI for the Cache Storage, allowing us to see the contents of the stored HTTP response. Entries with postfix :cache — actual HTTP responses. Entries with postfix :meta — to store the versioning meta information. Later this kind of stored data might be moved to indexedDB. TIP: If you keep DevTools open, the entries inside Cache Storage section most likely will not be updated automatically after each action from service worker side. If you wish to see the actual data, right-click and choose Refresh Caches. It makes sense to specify these resources using globs syntax because the exact URL of the font file could change from time to time to support webfont versioning. Also, you may notice that we have specified neither installMode nor updateMode. On the one hand, both will be set as prefetch in the resulting NGSW control file as this is a default value. On the other hand, they will be cached only after they were requested because the specifics of urls-way to list the resources. After we rebuild, run and switch to offline mode we will see the normal state of the application with all the icons in the place. dataGroups are independent of the app version. They are cached using their own cache policies, and it’s the proper section to handle our API responses. Let’s cache our tweet feeds for offline access as well as for optimized online experience. There is a main switch defining the behavior of NGSW: cacheConfig / strategy. For network-first strategy, it’s freshness, for cache-first — performance. You can get more details about the rest of parameters in my previous article. Now build, serve, click Load my timeline and Load my favorites buttons to get and cache API responses, and switch to offline. You’ll see tweets are displayed there as well! You may notice that for the Timeline NGSW is trying to reach the network (red line in the log) — this is how network-first strategy works. In the contrast, by clicking Favorites we just grab data from the Cache Storage. What about the optimization for online mode we’ve mentioned? 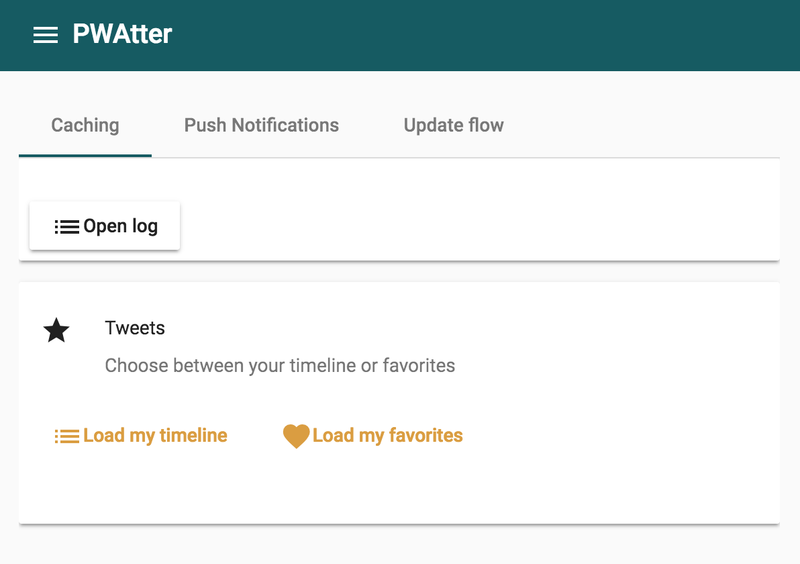 Return back to online and click Timeline / Favorites once or twice. It’s clearly visible that Favorites are loaded immediately, just because we skip the whole network trip and get the data from the cache. How to specify for how long to cache? Using settings in cacheConfig section — we have the fine-grain control there! Great. NGSW helped us a lot with some really smart network optimizations, requiring only some JSON configuration from us. What about more sophisticated PWA features like Push notifications? or use the ServiceWorkerModule’s SwPush class. If we open the SwPush API documentation, there is requestSubscription() method we need. I assume that we have VAPID public key somewhere in the app configuration (I created a simple ConfigService for this). You can generate a VAPID key pair here. To simplify the code I moved the negotiations with my backend to another tiny service called pushService. You will find the full working source code in my repo (branch ngsw). We send notification data straight away with the send notification request as a payload (NGSW can’t request this payload later, which is possible in general). Bottomline: push notifications are super simple to implement using Angular Service Worker. Now let’s go back to our application shell and its versions. How exactly NGSW handles the updates of our app? The user workflow should not be interrupted by the unexpectedly updated application. The app version in the opened browser tab will remain the same until the tab close. NGSW should keep app integrity. If any single file in application distributive was updated, we treat the whole corresponding version as a new one. This way we make sure that our application always has a consistent set of files. Let’s explore the NGSW versioning concept. By the version, we mean a set of resources that represent a specific build of our app. If any of the app files changed during the build, the NGSW control (manifest) file ngsw.json will be different (because of calculated hashes for assetGroups / resources / files section and/or different filenames in assetGroups / resources / versionedFiles section). The unique identifier of the app version calculated based on this ngsw.json file content and we have this hash as a part of the Cache Storage names. If this file is different from the previous, NGSW processes it and precaches the resources based on the updated configuration. It’s all done in the background. Important notice: when the DevTools open, service worker never stops/starts but constantly runs in the background. Since NGSW checks for the updated control file on its start, this behavior might break NGSW update flow. Just close the DevTools before testing this feature. Let’s test this great new feature on the real-world applications! You are welcome to request the new features and submit the bugs to the main Angular repo on the GitHub. Sooner or later we’ll have Angular PWA created by default like it happened for the create-react-app starter. If you wish to join the conversation about PWAs, you are welcome to the open PWA slack with 800+ developers. I’m open for the offers to hold Progressive Web Apps / Angular / Angular Service Worker workshops and/or sessions for your conference, meeetup or company anywhere in the world, reach out to me via salnikov@gmail.com.